Andy: You would think that the people who make Angostura bitters would have a rum with a little bitterness, but that is definitely not the case. This was a very smooth rum. It has a little spiciness and a little sweetness too, with a nice burn going down. It has a nice hint of vanilla. Mixed with Coke Zero, the flavors of the rum really stand out. It has a very cool, unique, kind of squatty bottle that will look great sitting on any bar. 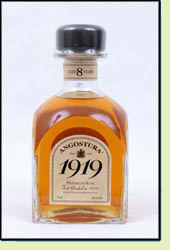 Adrian: Angostura 1919 is a really nice rum. It has a nice rich aroma and you can really taste the age. It is nice and smooth, without a lot of bite. Mixed with Coke Zero, it really holds it’s flavor. A great choice. Again, this like Santa Teresa is a good rum to have around. Yes they know bitters and when to keep unwanted bitters out if a great rum. Another solid purchase even if the bottle is a strange shape and awkward. No more than cannonball from Caltain Morgan.